Private tour for families. Travel in comfort with your own family in an air-conditioned Mercedes with a private guide/driver for a fun-filled day of activities just for the little ones. The children's tour is for families with small children, toddler to age 10. 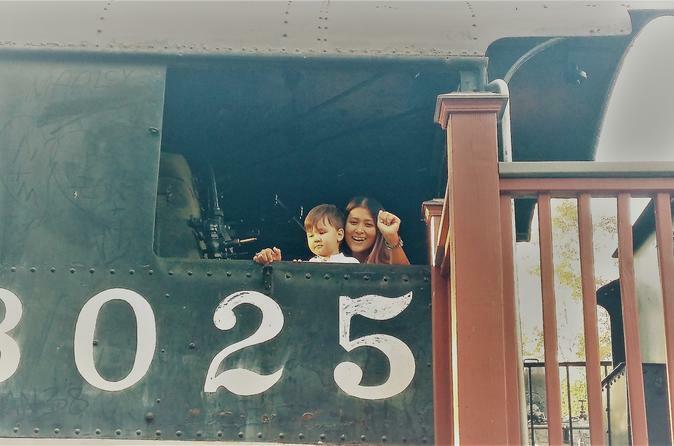 Spend an hour at Travel Town, where Los Angeles locals take their children to play on the trains. Then stop for lunch, then off to the La Brea Tar Pits for sabre toothed tigers. Approximately 5 hours duration, 9:30 to 2:30, starting in Los Angeles at Olvera St.
Our children's tour has been designed to entertain the little ones and their parents while visiting Los Angeles. You will visit Travel Town, a special place in Griffith Park, where local families take their children for a fun day or a birthday party. You can explore the old trains, climb aboard, then ride the little train around the area. A true delight for train lovers of all ages. Then we'll stop for lunch at The Farmer's Market where you have many restaurants to choose from, and can do a little shopping. After, we stop at La Brea Tar Pits to see the actual tar pit where the sabre tooth tigers and woolly mammoths once roamed. A fun and educational day for the entire family.